To prevent adding insult to injury, these foldable crutches make it easier for someone to put away long, awkward crutches when they are not needed. 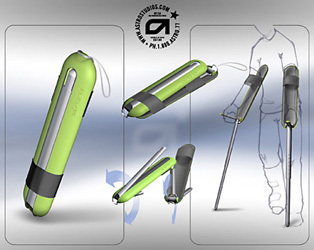 The innovation was driven from need, as one of the designers at Astro Design in San Francisco uses crutches. Starting as an arms-length pod these crutches can easily be stowed or carried—the leg folds out and the foot extends when the crutches are put to use.